When folks we LOVE are in the hospital or not feeling well, we want to offer them help. When we don’t feel our best, the Love Shaker is a wonderful way to bring a smile and feel better. Loved ones can fill the Love Shaker with their LOVE when they visit and shower whom ever is in need with LOVE for healing. They can shake LOVE when they are visiting sharing the healing feeling of LOVE with you. LOVE brought into a Hospital room is good for both it’s recipient and giver! The Love Shaker can be left at the bedside as a reminder of LOVE, support and healing wishes. 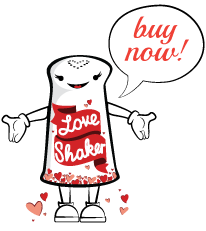 The Love Shaker offers hope when nothing else seems to help. Tuck ’em in for a restful nap with LOVE sprinkled on their pillow. LOVE helps us all heal more quickly and feel better faster.